Fibrous rings surround the atrioventricular canals and the origins of the aorta and pulmonary trunk. Insertion for the cardiac muscle fibres. coordinate the contractions of the heart chambers. Gives the heart its automatic rhythmic beat. The SA node initiates the impulse, which is rapidly conducted to the cardiac muscle fibres of the atria, causing them to contract. 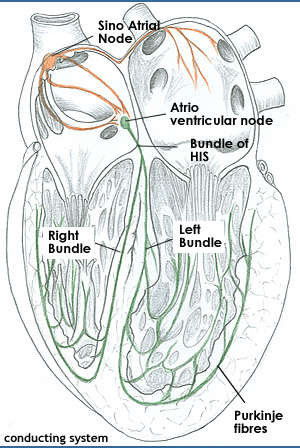 The impulse enters the AV node. Its branches to the papillary muscles, then throughout the walls of the ventricles. Although the heart has its own intrinsic rythmicity , this is subject to the influence of the autonomic nervous system.